I love living gluten free, writing about it, sharing what I find with you and coaching people through this life. There are so few things that I want to eat that I can’t find an alternative way to the original that suits my needs. Knowing the ingredients in the food you eat is key to make this happen. Asian ingredients are not my strong point so I need a lot of help in that area. 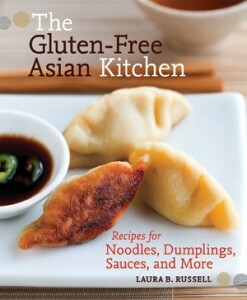 Take this new cookbook from Laura B. Russell, The Gluten-Free Asian Kitchen: Recipes for Noodles, Dumplings, Sauces, and More . This cookbook puts cooking delicious Asian meals at home well within reach for any Asian food lover, whether they are on a gluten free diet or not. Along with sharing easy, approachable recipes, Russell demystifies Asian ingredients and helps readers navigate the grocery store so that everyone can enjoy popular dishes from some of the world’s best-loved Asian cuisines. Not being familiar with these ingredients I found this extremely helpful. Asian food poses unique challenges to the gluten-free cook where essential condiments like soy sauce, tamari, even oyster sauce and hoisin sauce can be thinckened or sweetened with wheat product. Dumplings, pancakes, and many typs of noodles are blatant offenders, but it’s the sauces that often contain gluten and are harder to avoid. This cookbook has 100 tasty recipes so that any home cook can quickyl and simply turn out full-flavored dishes that have all of the goodness and none of the gluten, such as Korean Green Onion Pancakes, Sticky Rice Dumplings, Chilled Tangy Soba Noodles, Tempura, Soy Sauce Chicken and Banana ans Sweet Potato Fritters. The one food I’ve really missed are Pot Stickers. I used to eat these by the carton full. Since living gluten, dairy and rice free starting in 2007, I’ve not eaten very many Asian dishes at all and none of my favorite Pot Stickers. I decided to dive in and make Laura’s Gingery Pork Pot Stickers with a dipping sauce. 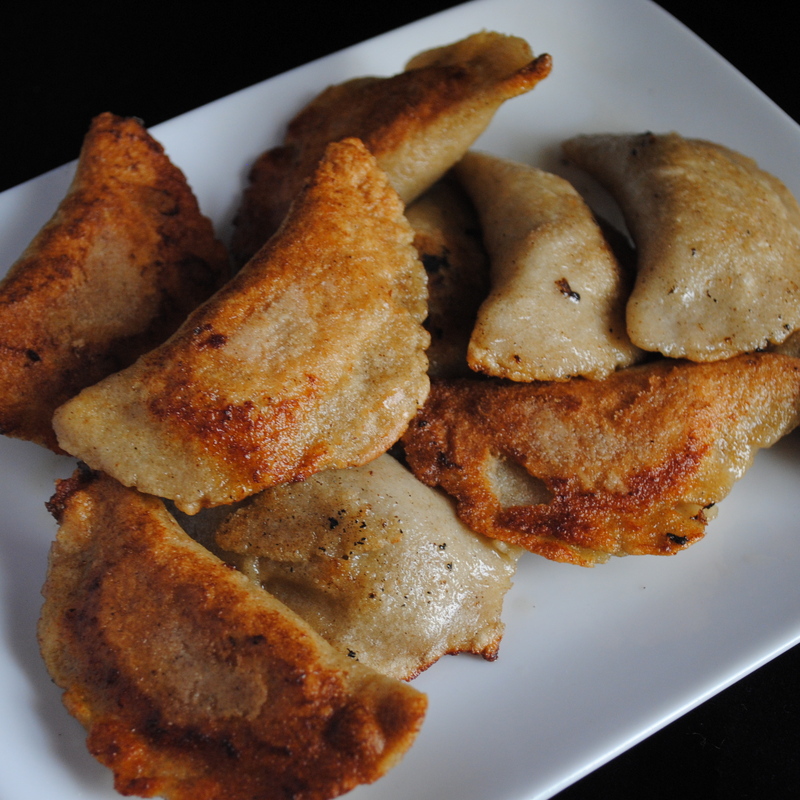 This recipe calls for rice flour but I swapped out sorghum flour. Even though I don’t eat soy I did make this recipe with it so I could see how the recipe worked. The next time I make it I’ll use coconut aminos. They taste like soy sauce but no soy to mess with my thyroid. The recipe was easy to follow. I really liked all of the options of making the dough for the dumplings ahead of time and then even freezing the extra uncooked ones for a great meal one night after soccer. Since this was my first time making this recipe it did take me a little longer as I was reading what to do and then doing it. Next time I’ll have had this experience and then it will go much faster. The only problem with this recipe was we couldn’t stop eating them because they were so good. The pork filling was amazing. I could see serving these at a party for sure. I’d make them ahead and freeze them or put them in the refrigerator until meal time and cook them right before serving. Hmmm, I see a party coming on! For another review check out Z’s Cup of tea. She made more recipes! Plus head over to Shirley’s gluten free easily for a chance to win this cookbook or 7 more! Ends August 28th. You can also visit Go Dairy Free for Alisa’s review plus this second one she did on Salad Rolls looks really good too. Great review, Diane! 🙂 We couldn’t stop eating those pot stickers either; I mentioned a couple funny anecdotes about that in my review. Of course you would be on the party list. I think I'll be eating the ones in the freezer for dinner tonight! I'll be sure to make a double batch next time. That was the recipe I was wondering about most. So glad to know it turned out delicious. Great review and thanks for the link-up Diane! Great review and I agree, it is a lovely book. Have been meaning to tell you I LOVE the new look of your site!!!! Gorgeous! Honestly, it doesn't make much of a difference to me whether it's gluten-free or not. What's really important is that I enjoyed the meal to the very last crumb.